ALBANY, New York, December 12, 2012 (ENS) – Seven states Tuesday notified the U.S. Environmental Protection Agency of their intent to sue the agency for violating the Clean Air Act by failing to address emissions of the greenhouse gas methane by the oil and natural gas industry. New York Attorney General Eric Schneiderman is leading a coalition of seven states, including Connecticut, Delaware, Maryland, Massachusetts, Rhode Island, and Vermont in this legal action, which requires a 60-day notice of intent to sue. “We simply can’t continue to ignore the evidence of climate change or the catastrophic threat that unabated greenhouse gas pollution poses to our families, our communities and our economy,” said Schneiderman. From severe droughts and heat waves to a string of devastating storms in the Northeast over the past two years, including superstorm Sandy in October, it is becoming ever more apparent that increasing greenhouse gas pollution contributes to climate disruption in the United States and around the globe, the coalition said in a statement. 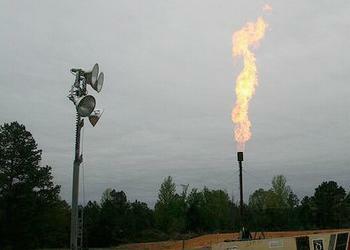 Methane is a very potent greenhouse gas. Pound for pound, it warms the climate 22 times more than carbon dioxide over a 100-year period. In making their case, the seven states point out that the oil and gas industry is the single largest emitter of human-caused methane in the United States and the second largest industrial source of domestic greenhouse gas emissions behind only electric power plants. The EPA has found that climate change caused, in part, by methane has “increased air and ocean temperatures, changes in precipitation patterns, melting and thawing of global glaciers and ice, increasingly severe weather events – such as hurricanes of greater intensity – and sea level rise.” In 2009, EPA determined that methane and other greenhouse gases endanger the public’s health and welfare. The EPA’s decision not to directly address the emissions of methane from oil and natural gas operations, including hydrofracking, leaves nearly 95 percent of these emissions uncontrolled. The EPA has determined that oil and natural gas production wells, gathering lines, processing facilities, storage tanks and transmission and distribution pipelines emit over 15 million metric tons of methane annually – the equivalent of the annual greenhouse gas emission of 64 million cars. The Clean Air Act requires EPA to set emission controls, known as New Source Performance Standards, NSPS, for industrial sectors that cause or significantly contribute to air pollution that endangers public health and welfare. 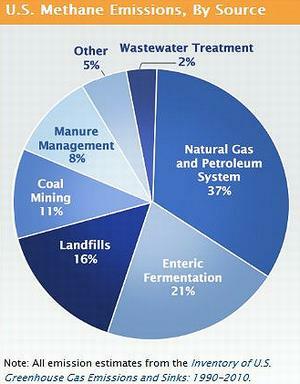 In August 2012, EPA revised NSPS regulations for the oil and natural gas industry. For the first time, these regulations included federal air emission standards for natural gas wells developed through hydraulic fracturing, or fracking, along with requirements for several other sources of pollution in the oil and gas industry that are currently not regulated at the federal level. But the revised NSPS regulations do not address the industry’s methane emissions, leaving almost 95 percent of these emissions uncontrolled, says Schneiderman. In their notice of intent to sue, the states argue that because the EPA recognizes that methane endangers public health and welfare and is emitted in large quantities by the oil and gas industry – and has 18 years of data demonstrating that many methods of controlling these emissions are available and cost-effective – the agency broke the law by deferring a decision on whether to set NSPS standards for methane emissions from the industry. In October, the industry produced new data showing that methane emissions from natural gas production were 53 percent below what had been estimated by the EPA. The data is based on a survey prepared by engineering company URS Corp. and environmental consultancy The Levon Group for the American Petroleum Institute and America’s Natural Gas Alliance. The new emissions survey is based on emissions from 91,000 wells operated by 20 companies distributed over a broad geographic area. EPA’s data were derived from only 8,800 wells over a smaller area. The URS report also estimates that venting of methane into the atmosphere during liquids unloading – a technique to remove water and other liquids from the wellbore to improve the flow of natural gas – is 93 percent lower than EPA’s estimates and that methane emissions from well re-fracturing are 72 percent lower.